BEIJING -- Audi dealers in China are demanding 28 billion yuan ($4 billion) to cover losses over the past three years that they blame on the automaker adding too many distributors, potentially worsening a sales decline that saw BMW and Mercedes-Benz overtake the luxury brand last month. The dealers met Thursday in Sanya, China, and issued a statement saying their newly formed group would oppose Audi's planned formation of a second joint venture with SAIC Motor Corp. in China until the automaker managed to reach 1 million in annual sales in the country. Audi sold a little more than half that many units in China, including Hong Kong, last year. Dealers are currently affiliated with Audi's partnership with China FAW Group Corp.
"We are clarifying the allegations" of losses between 2014 and 2016, Johanna Barth, a spokeswoman for Audi China, said on Thursday. "To our knowledge, the overall business of Audi in China was profitable in those three years." Song Tao, a representative for the dealer group, said they are working closely with the automaker to achieve "mutual benefits," declining to specify what action they will take if their demands are not met. Once a highly lucrative trade, profits from automobile distribution have slid in recent years as automakers expanded their sales network and car ownership became widespread in major cities. Dealers in China are also over-reliant on the sale of new cars, whereas used-car sales and servicing make up the bulk of a dealer's income in the U.S. Besides Audi, distributors for Kia, BMW and Toyota have also demanded financial assistance from automakers in the past two years. Volkswagen Group, the parent of Audi, has sought to revive growth by adding another sales network through a second joint-venture with SAIC. That plan ran into a wall of opposition from existing Audi dealers, who briefly threatened to stop sales before the automaker agreed to discuss the payment of subsidies. In its statement, the Audi dealers said that back in 2012, the automaker had targeted 1 million in sales by 2020 on a network of 580 outlets. However, there are now 530 outlets even though deliveries failed to break through a "bottleneck" in the past three years of about a half million units. Audi should come up with a "suitable solution" based on the target and excess number of distributors, the group said. Audi delivered 591,554 units in China including Hong Kong last year, an increase of 3.6 percent. The automaker is seeking clarification as it didn't set a target of 1 million sales units by 2020 in China, Barth said. After entering the country in the late 1980s with China FAW Group Corp. and building an early lead, Audi sales rose and the marque became the quasi-official ride of high-ranking government officials and privileged businessmen. The luxury marque recorded its first annual sales drop in China in more than a quarter century in 2015. Near its peak, around 2000, the German brand accounted for about 70 percent of government and state-owned company fleets in China. 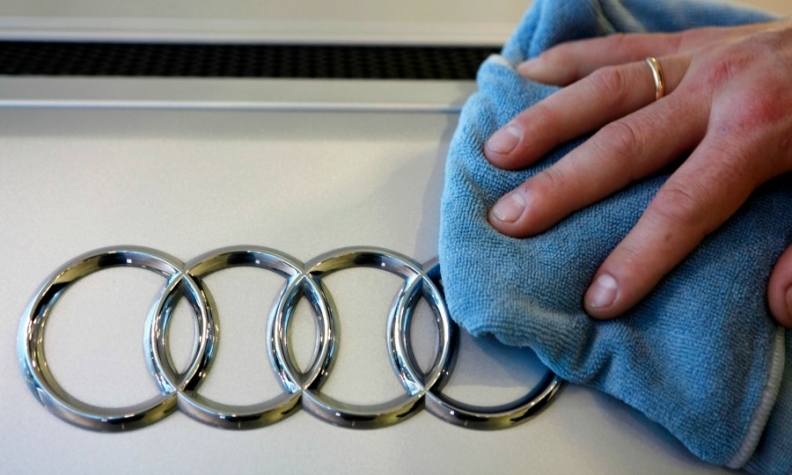 Audi lost its leadership in China's premium car segment in January as deliveries fell 35 percent to 35,181 units. Sales of Mercedes and BMW brands both surpassed Audi as they increased 39 percent and 18 percent to 59,000 units and 51,000 units respectively.